While many agree that this flooring material adds both beauty and character, there is a debate whether hardwood should be installed in a kitchen design. We’ve compiled a list of pros and cons, so you can decide whether wood flooring is the right choice for your kitchen remodel. 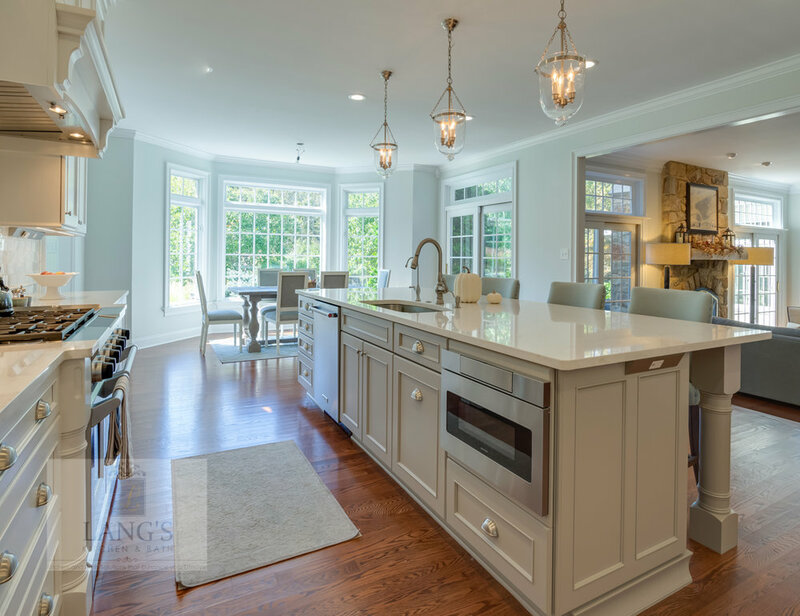 When it comes to style, hardwood floors are classic and alluring, complimenting any style kitchen design – shaker, contemporary, rustic, coastal, and more. Additionally, if you have hardwood in other rooms on the main floor of your home, particularly with an open space floor plan, installing hardwood in your kitchen provides flooring continuity throughout the entire living space. Hardwood floors can last a lifetime when they’re properly maintained. 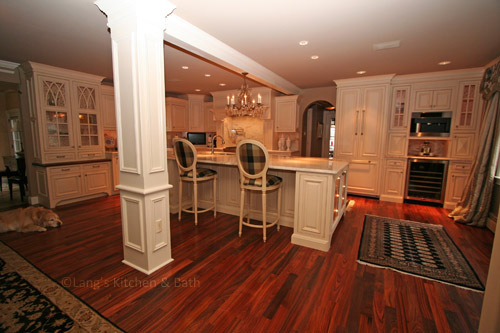 When selecting a hardwood for a kitchen renovation, it’s best to choose one of the stronger woods, like oak or ash. Take advantage of wire brushed finishes, as they work best in high-traffic areas, so your floors retain that polished look. Be advised that high heels and pets’ claws will leave their mark on occasion! Consider the marks part of the charm of hardwood floors in a well-loved home. On a day-to-day basis, hardwood is fairly easy to maintain. Just give it a regular dusting, the occasional mopping, and you’re good to go! Most hardwood repairs can be done simply by sanding imperfections and refinishing the floor. Tiles and laminates must be fully replaced if they crack, chip or are warped in another fashion. Hardwood floors are pricier to install than tile and laminate, but they increase the value of your property. 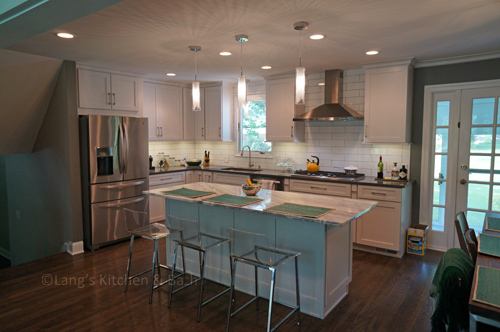 This is a key consideration in any kitchen remodeling project, if there’s a chance you may sell your home during the lifetime of that kitchen. When it’s time to sell, it will be a strong selling point that realtors can use to help you sell faster and put more money in your pocket. Unlike tile, which is hard and cold, hardwood is soft and warm. If you spend a lot of time standing in your kitchen (like most of us do), hardwood will be easier on your knees and feet. Additionally, it will retain the heat better, unlike tile, which allows the heat to escape. Hardwood floors are expensive. Wood planks can cost you anywhere between $4.50 and $15 per board. Remember, though, that this cost is an investment in the value of your home both for your own use and for resale value. 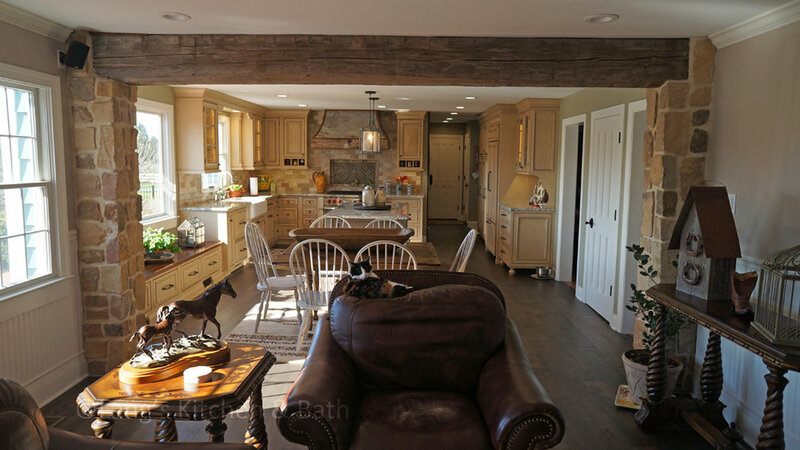 An experienced kitchen design specialist can help you navigate the wood flooring product lines to find the right one for your style and budget. Additionally, you need to consider installation costs, which are approximately $4.50-$10 per square foot. This installation process is often difficult and cumbersome. To avoid incurring more costs and delays in your kitchen remodel, the flooring installation should be undertaken by a professional. Softer woods, like pine, are prone to dings and scratches, which is why it’s best to go with a harder wood. Additionally, hardwood is not immune to water damage. A spill or puddle that is mopped up quickly is not cause for concern. Standing water or an unresolved leak, however, will cause the wood to warp, split or get moldy, requiring the entire section be replaced. If you want your hardwood floors to keep their shiny, polished look, they will need to be sanded and stained every 10-15 years, depending on wear and tear. It can be both a costly (if you hire a contractor) and time-consuming experience. On the other hand, it extends the life of your floor almost indefinitely, unlike tile or other flooring options. For inspiration for your kitchen renovation, visit our Newtown showroom or design gallery to see options for wood flooring and kitchen design. 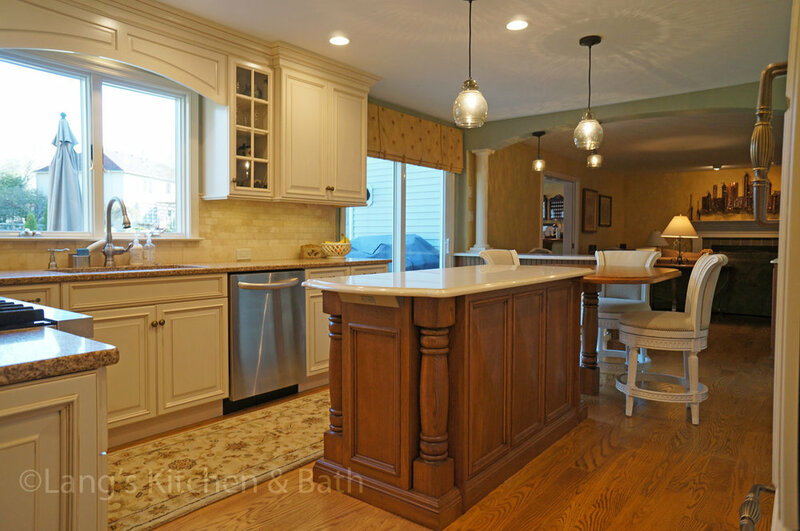 If you’re all ready to get started, contact Lang’s Kitchen & Bath today!